Last Saturday, my parents came over to watch Bubbles and take her out to Toys R Us (I know!). Roboman and I had a wonderful half a day just being with each other. The place we wanted to go for lunch (Sui) at Craig Road was unfortunately closed. Still, it was lovely just wandering around the quaint Duxton area before heading some place else for a meal. 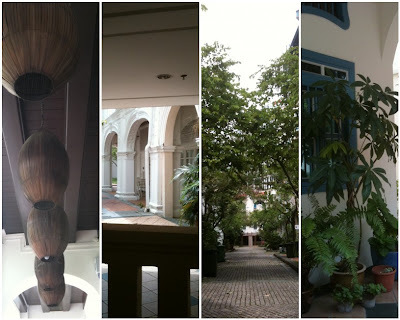 I really enjoy looking at the architecture of old buildings in Singapore. We unfortunately don't have many left. Both of us loathe crowds in general (I only brave them when I want to do shopping) so we soaked in the quietness of the area during our little walk, hand in hand.